There are many types of moments that make you grateful to know the people that you know. That you didn’t just stick your hand into a barrel of apples & hope for the best. Nope – they’re hand-picked quality. 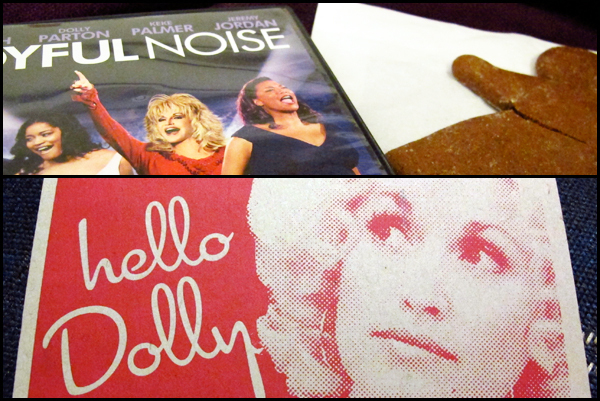 & sometimes when you’re having a rough day…they are there with gluten-free gingerbread ladies, Dolly Parton movies, & sending you Dolly postcards in the mail. That Dolly postcard was screaming your name at me in the store. And Dolly’s name, obviously. Amanda, I love it! It’s going up near my desk. ha! Helllllooooooo Dolly! Perfect timing! That was such a great line. It’s like she has them all tucked away in her pocket for the most opportune times. & you didn’t need much to get my attention with your genuine sense of self & amazing laughter – of course, add a glitter hoop to that & it was all the more alluring.